Laundry Room Make-Over Has me Stumped!! 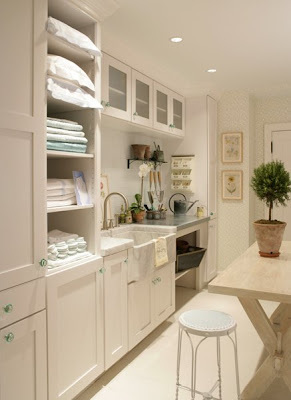 These first four laundry rooms I could live with! I have been busy working on our laundry room and I am having a really hard time making decisions. Do I paint the walls?? They are Benjamin Moore's silver marlin (the robin's egg blue that everybody and their brother did and is still doing). I still like it and it's still in good shape, but I'm not delighted with the way it looks with the fabric I've chosen. Do I paint the cabinets?? They don't need it either, the color is a nice beige, BUT I keep picturing them in black. There isn't that many, so I could do it in a day-maybe two. 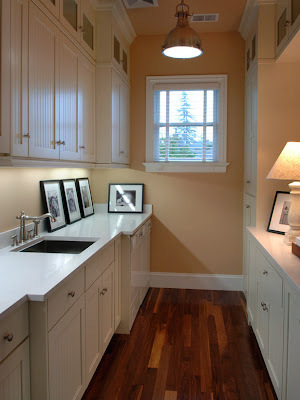 (Did ya notice that all the cabinets in the laundry room photos above are white or stainless steel?) See, that proves that I am confused.What to do...what to do!!!! I made a big mistake and did all the pretty, fun stuff first - is that called fluffing in the design business? I love everything I have made so far and I have found some real neat things. But...I still don't think it looks like a real make-over. I removed the dinosaur computer from the built-in desk and now I have my new sewing machine there. I still have my printer there to use with the laptop. So, this small room is a laundry and sewing room and also part office! Oh yeah, the ironing gets done in there too. And then there's the big, square laundry sink where we bathe our chihuahuas, AKA "the babies"! I think I am beginning to see what the problem is. I don't want a work room/sewing room/office!! I want a beautifully designed room that is so wonderful that I will be thrilled to fold the laundry, and bathe "the babies", and sew silks and linens, and press the silks and linens using lavender scented starch. Obviously, I have to get over the romantic laundry room notion! So, tomorrow I will buy paint, push up my sleeves, and get down to business on continuing my plans with a fresh look for a real-life laundry room. Hopefully, I will unveil it early next week, so stay tuned!! Until then, here is a glimpse of things in progress. Go with your original plan....sounds like you still like the wall color, but you have already planned something differant in our mind...hence the beautiful fabric we glimpsed....whatever you end up with, I'll bet it will be gorgeous. I wish my laundry room was large enough to serve multi-purposes. Good luck and I can't wait to see the finished product. Love your plans there. Cute sneak peeks. My laundry room will just get a coat of leftover paint, lol. Right now my laundry room is a storage space, with some nice decor; but it is on my list to renovate later in the summer. I am currently having a few other rooms painted. hopped on over from Anita's......sounds like you have some fabulous ideas. The ones you pictured are gorgeous...but would never happen in my house. I can't wait to see what you are going to do! I love your ideas so far! I'm going to sign up to follow you so i don't miss the update!!!! Come on over and visit me at SouthernInspiration sometime!! !